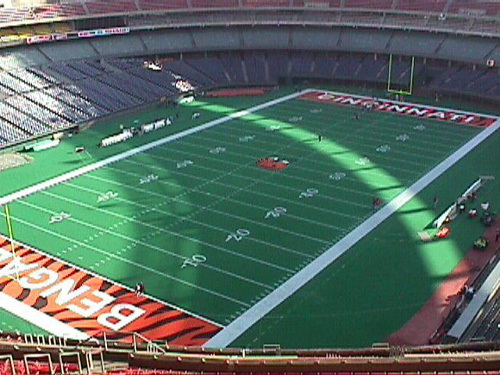 In 1970 the Bengals moved to play at Riverfront Stadium, a home they shared with the Cincinnati Reds until the team moved to Paul Brown Stadium in 2000. Despite Cincinnati’s love of baseball, it was the prospect of a professional football team that finally moved the city to end twenty years of discussion and build a new stadium on the downtown riverfront. After playing for two seasons at Nippert Stadium on the University of Cincinnati campus, the Bengals built on the Reds’ success in the stadium’s first year when they recorded their first winning season and first playoff appearance in 1970, just their third year of existence. Riverfront Stadium is seating for 56,200.